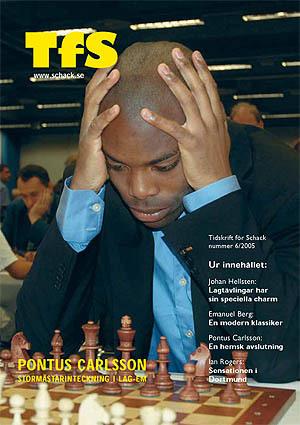 Pontus Carlsson was born December 18, 1982 in Cali, Columbia and is Sweden's 16th Grandmaster. After a tragedy claimed his entire family he was adopted by a Swedish couple and raised in the Nordic country where wood is the top export and the winters are famous for skiing. A dual citizen of Sweden and Columbia, Carlsson has risen to stardom in the chess world by virtue of consistent play and determination. Known as a rapid specialist, Pontus had gained notoriety by winning the Tusenmannaschacket Rapid tournament an unprecedented three times. After rising through the ranks, Carlsson began to excel at the national level by playing on the triumphant Sollentuna Club, a club that has represented the country in the European Team Championships several times… winning once. Carlsson has represented Sweden since his schoolboy years and has now claimed a position on the national team. He represented the country in the 2006 Chess Olympiad in Turin, Italy. In the span of a few years, Carlsson earned the requisite norms to earn both the International Master and Grandmaster titles. He has spent time in Spain playing in competitive tournaments and also studying Spanish. Now with many goals behind him, he looks forward to playing in more international competitions outside of Europe and aiming to break the 2600 barrier. Read, "The Marvel of GM Pontus Carlsson"